Show off your outdoorsy side with this sophisticated Antler Oblong Tray from Arthur Court. 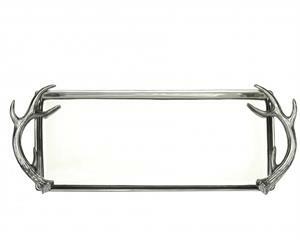 Sweeping horns adorn the sides of this sleek, 19-inch tray, creating unique, textured handles. Handcrafted in sand-cast aluminum, this tray's interior gleams brilliantly against the intricate detail within the antlers. Size: Length: 19.0" / Width: 8.0"